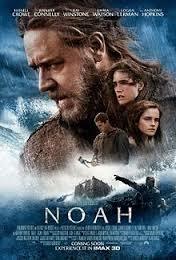 The movie opens with the text of Psalm 34:11, and actually builds on that theme pretty well. For all its faults, Legiondoes make God seem pretty scary. Fed up with man’s wickedness, He dispatches His angelic legion to exterminate us. However, the Archangel Michael (Paul Bethany) refuses to give up on man, and possibly refuses to believe that God has really given up. He drops into Los Angeles on Dec. 23 and hacks off his wings with a combat knife. He then breaks into and loots a gun store, steals a police car, and drives to a trailer park in the middle of nowhere called Paradise Falls. At the Paradise Falls diner, we meet a motley crew of characters from different walks of life who either work in the diner or have had the misfortune to get lost/break down there. Most notably, we meet Charlie (Adrianne Palicki), a seemingly insignificant, poor, unwed mother to be, and Jeep (Lucas Black), her live-in boyfriend. Not only is Jeep not the father of Charlie’s child, but she has slept with just about everyone in town except him. Nonetheless, he loves her and offers to help her raise the baby. Why sneak out the door with the guns when you can blow something up? There follows an unintentionally comical scene, in which a little old lady (Jeanette Miller) orders a rare steak, uses the c-word, bites a guy on the neck, and then climbs the wall ala The Exorcist, before being shot to death by Kyle (Tyrece Gibson), the token gangsta of the film. 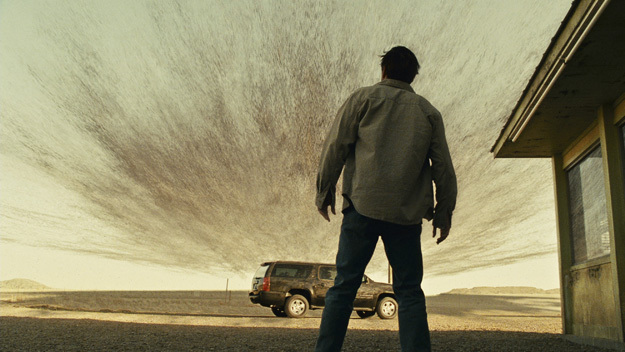 Then we see a swarm of bugs that has nothing to do with the rest of the movie. Then Michael shows up and shoves sub-machine guns into everyone’s hands, telling them more like the old lady are on their way. Michael explains that the deformed maniacs now assembling around the diner are possessed — not by demons, but by angels! 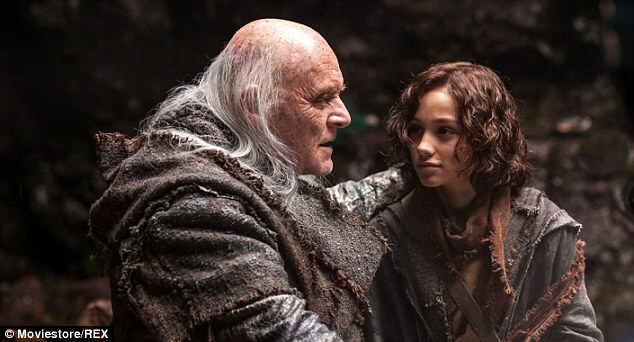 He has come to protect Charlie, because her child is humanity’s hope for survival. Yep. The male child of an insignificant, young, single girl, born on Dec. 25 in the middle of nowhere is humanity’s hope. Ever hear a story like that before? Other than a vague reference to the child “leading mankind out of darkness,” no explanation for Michael’s assertion is ever given. From there, Legion shifts from The Exorcist to Night of the Living Dead, as the Possessed try to fight their way into the diner. The whole ordeal raises a lot of questions. If God has truly despaired of humanity, why is He committing so many resources to killing this child? And if He hasn’t, why not let the child live? Why do the Possessed sometimes exhibit a survival instinct and other times not? What are the rules on angels? Are they truly immortal, or just tougher than humans? Do they lose their powers if they cut their wings off? The movie never seems to make up its mind. 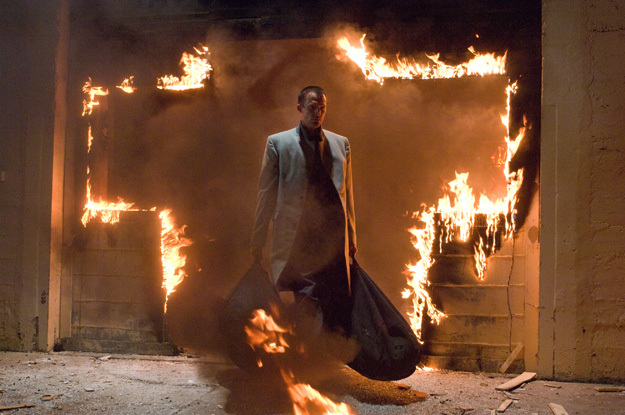 If humans possessed by angels can’t come near the child, why can Gabriel (Kevin Durand) walk right in the door? And when we see that God has apparently resurrected Michael and given him a new set of wings, just in time to save the day, are we to assume that Michael somehow changed God’s mind, or that this was what God had in mind all along? Such questions matter not to director Scott Stewart. I don’t believe there was ever a hope on his part to do anything more than make a cool, scary action movie. And action there is. Bethany gets a few fight scenes that would make Chuck Norris jealous. Near the end, there is a scene where Michael and Gabriel go one-on-one in the diner and tear the place apart. 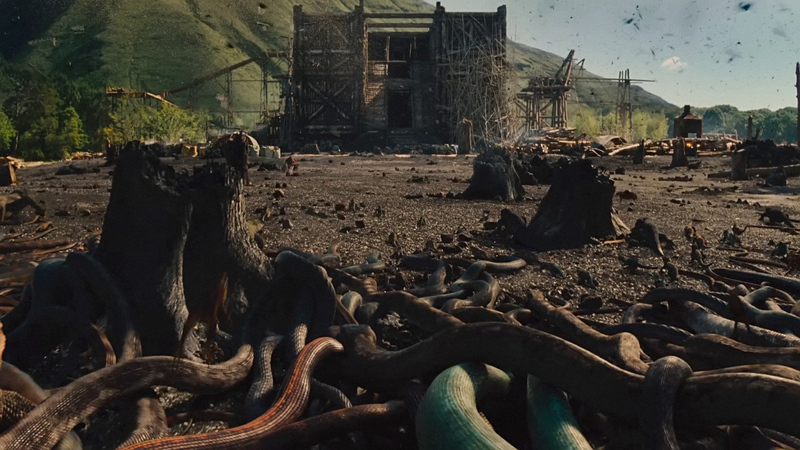 This scene, if you will pardon my technical jargon, is probably the most freakin’ awesome action sequence I have seen since Spiderman 3. It’s worth sitting through the rest of the movie for. I can’t say I recommend this movie, but I definitely recommend searching YouTube for the angel smack-down scene. Can I get heck-yeah? So why do a review of a movie that turns 50 this year? Because every so often there is a movie so great that it transcends time; a classic. None the less, due to the shear volume of material put out by Hollywood, great films can be forgotten just because they didn’t come out in the last year or two, or because audiences get comfortable with different styles. To put it simply, greatness should not be allowed to die. 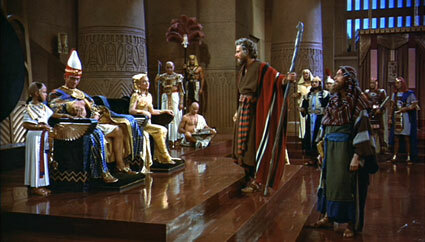 The Ten Commandments was directed by savy Hollywood operator and professing Christian Cecil B. Demille. The fact that some of Demille’s movies were based on parts of the Bible automatically drew some criticism. One contemporary accused Demille of making “small-minded movies on a huge scale.” The “huge scale” part definitely applies to The Ten Commandments. Demille had to employ a cast of thousands of extras to recreate Pharo’s army and the mass Exodus of Hebrew slaves. The story spans 85 years and takes 3:39 to unfold, and every scene – nay, every line of dialogue – drives the story. And of course, then-revolutionary techniques were used to make the Red Sea sit up and beg, making movie history. One of the temptations that Moses brushes off like dandruf. Heston must have taken a lot of cold showers. But small minded? No one can take an honest look at this film and seriously hold that belief. This is one of the most compelling and thoughtful pictures ever made. The early story happens during a politically volatile period in the (speculative) history of ancient Egypt. 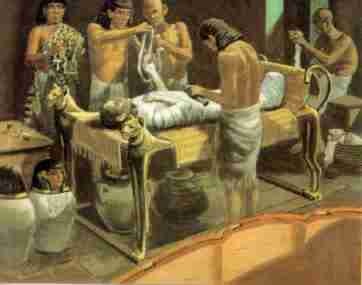 Pharo Sethi I is nearing the end of his life and his throne must naturally pass to his biological heir, the ambitious Rameses II. Yul Brynner is absolutely brilliant in this role. You don’t like him and yet you’re compelled to respect him. Driven by his desire for the crown and for the beautiful Nefretiri (Anne Baxter), he puts force that few actors can into every scene he appears in. Sethi has nearly equal force, however, and superior power. Like most old men who’ve spent their lives being waited on, he has begun to worry about his legacy. He prefers his sister’s adopted son, Moses, who never stops building tributes to him, as a successor. Rameses begins hatching plots to undo this adopted brother. Nefretiri, a hormonal adolescent girl with the power of a princess, plays her own game. Madly in love with Moses, she can’t bear the thought of being wed to Rameses. She constantly praises Moses and sweet talks Sethi. 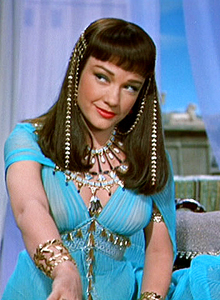 One scene between her and Rameses is one of Hollywood’s more memorable scenes. It’s a reminder that movies were much more powerful when the sexual tension was kept below the surface. Nefretiri is not passive, however, her passion drives her to extreme lengths, including murder. There are an assortment of other wily characters with their own motivations to add interest. All of this is superbly done, and plenty for four stars. But so far, all this political maneuvering and forbidden romance could be in The Godfather, The Good Shepherd, or any number of intrigue movies. What makes The Ten Commandments different? The protagonist. Moses never criticizes the other characters; he simply passes through the politics and back-stabbing as if he doesn’t notice it. Differences between Moses and the others begin to show right after Nefretiri has killed her hand maiden. Moses is knocking at her door. After a minute of romance, Moses learns that she has killed Memnet. He insists on knowing why, and drags it out of her that Memnet told her about his Hebrew heritage (unknown to him). She spouts typical Hollywood rhetoric, e.g., “I love you, that’s the only truth I know.” His reply is “love cannot drown truth.” Moses is favored above everyone else in Egypt, and its throne has now been promised to him. He has every comfort he could want and a beautiful woman madly in love with him. 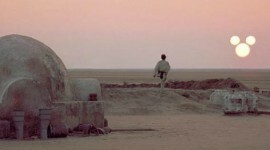 However, the revelation drives him to uncover his past, and he actually leaves the palace to work in the brick pits. 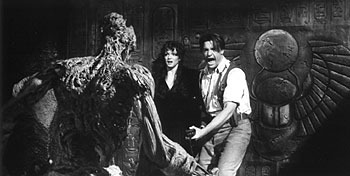 His mother and Nefretiri urge him to stay, telling him that justice and truth are better served from a throne. This is just one age-old struggle the movie addresses; shouldn’t righteous men seek out power for the benefit of all? – and yet power so often rules the one who has it and makes him more wicked than any tyrant he replaced. After Moses is arrested, Sethi asks him “Why are you forcing me to destroy you?” Moses replies “The evil that men should turn their brothers into beasts of burden … if there is a god, he did not mean this to be so.” Moses bears the fall from next pharo to condemned prisoner with remarkable grace, out of nothing more than an un-named conviction of what is right. How many of us have that kind of strength? 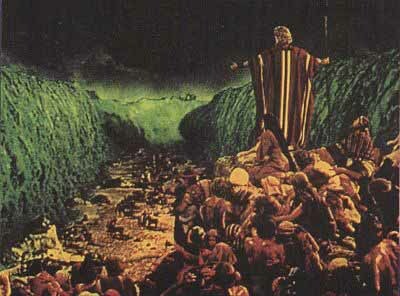 We are, of course, eventually directed to the “Power that has shaped Moses’ way,” as he puts it. 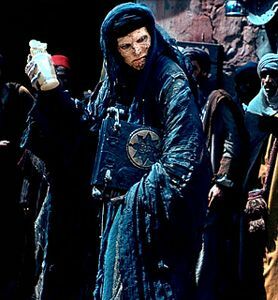 The Ten Commandments does a number of things that contemporary audiences will be uncomfortable with, including overt references to Yaweh, the God of Abraham, as opposed to vague references to “God.” It’s unlikely DeMille would have taken the same criticism if the film wasn’t such an uncompromising statement of Biblical truth. If you haven’t seen The Ten Commandments for a few years, you owe it to yourself to at least rent a copy. If you’ve only watched it on TV, there is a part that is usually cut. No matter how many times I watch The Ten Commandments (don’t worry, I try to stay busy while I watch it), I can never bring myself to skip past it. In an unusual (possibly unique) move, DeMille addresses the audience face to face before the film starts. DeMille’s passion is infectious, and he brings the whole purpose of the movie into focus. The theme of The Ten Commandments, DeMille emphatically states, is “whether men are to be ruled by God’s Law, or by the whim of a dictator like Rameses. Are men the property of the state, or are they free souls under God? This same battle continues throughout the world today.” How true. We need only look at the history of the United States to see that, as our government and culture have progressively rejected the Law of God, we have seen not freedom, but an explosion of government invasion of everyone’s lives. 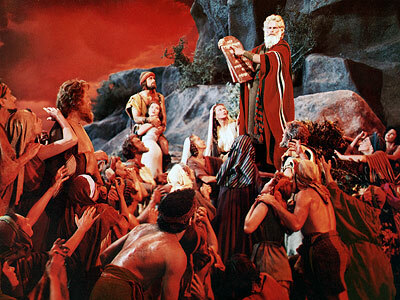 Everyone remembers the Red Sea scene from this film, but few remember the true climax of the story, after Moses has received the Commandments from Yahweh. He goes back down the mountain to find the people worshiping the Calf and reveling in depravity. Dathan (Edward G. Robinson), a rabble-rouser, declares “We’re gathered against you Moses. 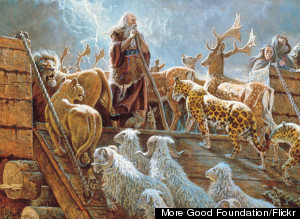 We’re free!” Moses shouts “There is no freedom without the law!” What more is there to say? I guess there’s still the Gospel. But DeMille tried to force that into the 1920s version of The Ten Commandments, and it ruined it. One movie can only do so much. But this one does all that one can – and then some. The Book isn’t bad either.